Chief Frances Garcia Cooke (April 17, 1883 [source] - July 19, 1946) and husband Frederick S. "Fred" Cooke (March 28, 1881 - 1958). Chief Frances, who inherited the title and responsibility from her father, Isordoro/Isidore (April 4, 1860 - Feb. 17, 1946), descends from individuals who, on her mother's side, lived at Chaguayabit (aka Tsawayung), a Tataviam Indian village at Castaic Junction, prior to European contact in 1769. Fred's lineage can be traced to California Indians of undermined origin, probably including Tongva, as his paternal grandmother Trinidad Espinoza was born at the San Gabriel Mission. His maternal grandmother, Florida Parker, is identified in mission records as a California Indian. 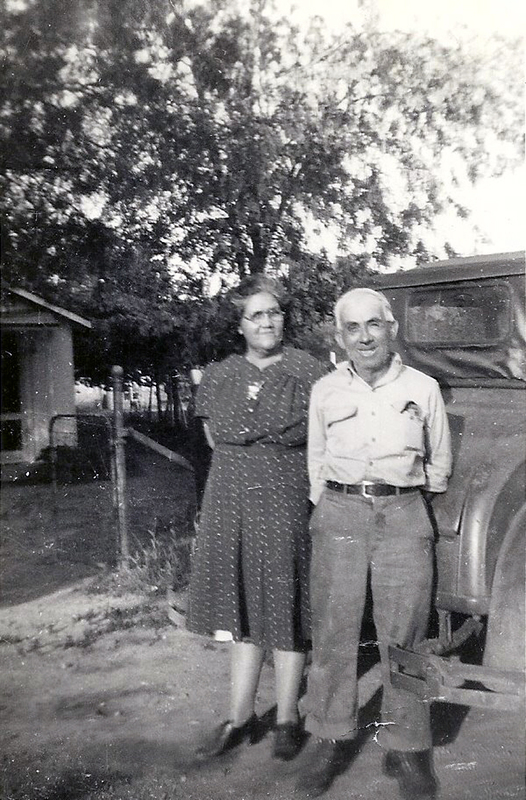 Fred and Francis, as their descendants refer to them, are considered the patriarch and matriarch of the modern-day Cooke and Garcia families (Garcias by way of Fred and Frances' daughter Mary Cooke, who wed Luis Garcia to become Mary Cooke Garcia). Fred and Frances added the "e" to the end of "Cook," which was the surname of Fred's father, Dolores. Fred and Frances are the only Cookes (at least as of 2014) known to have been buried at the Ruiz-Perea Cemetery in San Francisquito Canyon, where they rest beneath the same headstone. LT0100: 19200 dpi jpeg from smaller jpeg courtesy of Leticia Thomas | Online image only.